Be the CHANGE grantee Bryant University PA Program partnered with Clinical Esperanza/Hope Clinic (CEHC) to operate a student-run, PA-supervised diabetes clinic that provided free diabetic retinopathy screenings to improve health for low-income residents in Providence, Rhode Island. Diabetic retinopathy is the most common cause of vision loss among individuals with diabetes, and the leading cause of blindness among working-age adults. Through this project, more than 40 patients received screenings to facilitate early diagnosis, preventative care, and referrals for those with severe diabetic retinopathy. Using an automated retinal camera, PA students quickly and easily obtained high-quality images of a patient’s retina during routine diabetes care. The images were interpreted by a board-certified ophthalmologist, the cost of which was covered by the nccPA Health Foundation’s Be the CHANGE grant. Before using the retinal camera, patients needing specialized care were difficult to distinguish; and the waiting period for an ophthalmology consultation exceeded six months. The retinal images allowed patients with acute diabetic retinopathy to secure treatment in a matter of days-to-weeks, saving individuals from more severe vision loss due to prolonged wait times. PA students identified two cases of diabetic retinopathy so severe that urgent treatment was needed. One patient’s treatment not only prevented bilateral blindness but also improved the patient’s vision. Students also identified several mild cases of diabetic retinopathy, which allowed patients to receive proper follow-up care. In addition to enhancing the quality of care provided, the project also broadened student knowledge. Approximately 70 PA students and 5 PA faculty members were involved along with 9 other healthcare providers; and the project’s results were presented at the Society of Student-Run Free Clinics Annual Conference in Omaha, Nebraska. The Bryant University PA Program plans to seek additional funding to ensure clinic patients can continue to receive retinal exams. This project was funded in-part by the nccPA Health Foundation’s Be the CHANGE grant. Learn more about the Health Foundation’s grant programs at www.nccpahealthfoundation.net. Using the retinal camera was one of the first moments in which I began to blend my didactic education with hands on clinical experience. The benefit was two-fold, helping me understand the complex anatomy of the retina and its associated diagnoses, as well as providing an invaluable examination easily. 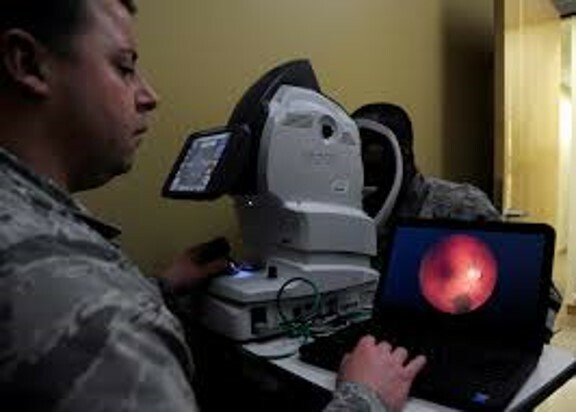 Students were taught how to operate an automated retinal camera, which captured high quality images of patient’s retinas in order to obtain a diagnosis. Check out the work of past Foundation grantees in our Spotlight Archive.